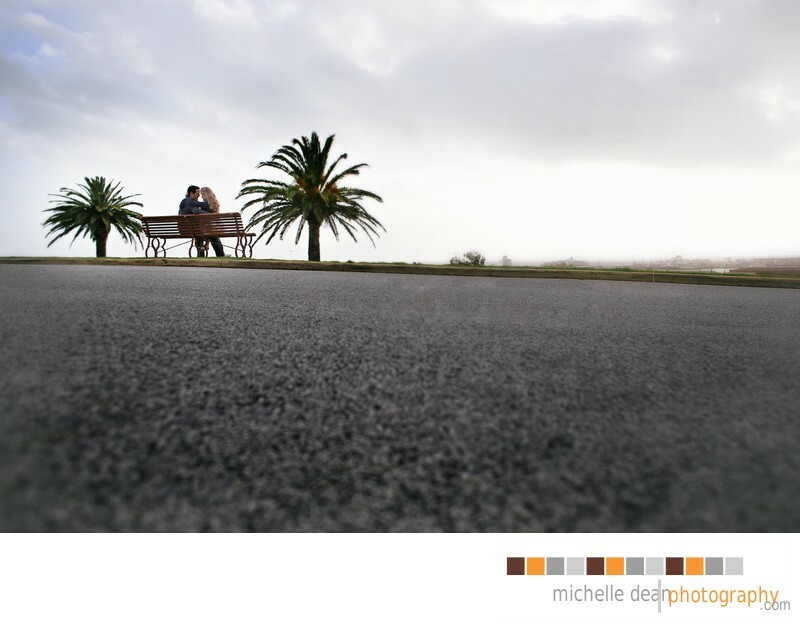 Living near Fremantle is wonderful as it allows easy access to so many locations for beautiful our engagement sessions. The area is filled with great photo locations whether along the harbour or away from the coast. With all that is on offer sometimes it is the simplest of locations that make for the most amazing and romantic photographs. Our candid approach helps create a relaxed atmosphere where the couples can get lost in the moments. The couple chose to begin their photo session on one of the hills overlooking the ocean. The weather had been beautiful leading up to the shoot but a few hours before the clouds began rolling in and rain began falling in the area. We are always prepared and our years of experience allows us to photograph in all weather conditions. Beautiful photos like this are a result of knowing how to utilise the elements to create a powerful image regardless of the situation we are presented with. The clouds and lighting created a mood and I wanted to use the area to lead the eye to the couple and allow the focus to be on the moment they were sharing. I felt keeping the image simple with powerful leading lines would accomplish this without making the picture too busy. I believe the most romantic moments are those just before or after a kiss and intimacy is the strongest when the subjects are lost in the moment. Our clients comment regularly that they love how relaxed our sessions are and how comfortable we make the process.